”APR” stands for “anti-polishing ring.” Other terms for anti-polishing rings include “carbon scraper ring,” “piston cleaning ring,” and “bore polishing ring.” Whichever term you use, it refers to a newer development in Cummins ISX engines where a cylinder liner will have an anti-bore at its top that holds a ring insert. You can see the diagram below of the liner and ring profile. Like most engine design changes, the development of an anti-polishing ring was created with a particular purpose in mind. In this case, that purpose is removing carbon buildup from the piston. Looking at the diagram above, you will notice that the ring insert protrudes slightly from the interior cylinder wall. Because of its protrusion, it comes into close contact with the topland of the piston. This close contact doesn’t allow for even the slightest bit of space between the piston and the ring, meaning the ring will scrape away any carbon that would otherwise accumulate on the piston (which is why some people call it a carbon scraper ring). By preventing carbon buildup, the ring also prevents liner polishing (which is why it’s also called an anti-polishing ring. Cylinder walls are made to have peaks and valleys, and there is a particular bore surface finish that allows the engine to run its best. Engine Build Magazine has a detailed explanation or various cylinder bore surface finishes if you’re curious to know more about that. When there is too much carbon built up on a piston, the carbon slowly files down the peaks of the liner wall. When these peaks are worn down enough to almost eliminate the troughs of the liner will, it is known as bore polishing. Bore polishing can lead to many serious issues. The most common issue that bore polishing leads to is an increase in oil consumption. It is natural for an engine to consume some oil. But if you notice that your engine seems to consume oil excessively, try using Cummin’s oil consumption evaluator tool. In addition to oil consumption, bore polishing can also cause DPF regeneration, increased oil filter flow, plugged oil filters, and sticky VGT actuators. None of these are good for your engine and can cause you a lot of money if not taken care of. The benefits of getting anti-polishing ring cylinder liners are that they are proven to dramatically reduce the chances of these problems occurring. APR liners must be used with certain pistons. They cannot be used with open skirt pistons. They cannot be used with high top ring pistons. They must be used with closed window, reduced diameter, low top ring pistons. All six cylinder liners must be the same. Liner shims must be replaced with new shims upon installation. Perhaps the easiest way to make sure everything is compatible when you upgrade is to buy a complete engine rebuilt kit. Our techs will make sure you get everything that you need to switch your engine to APR. Check out our APR offerings here. 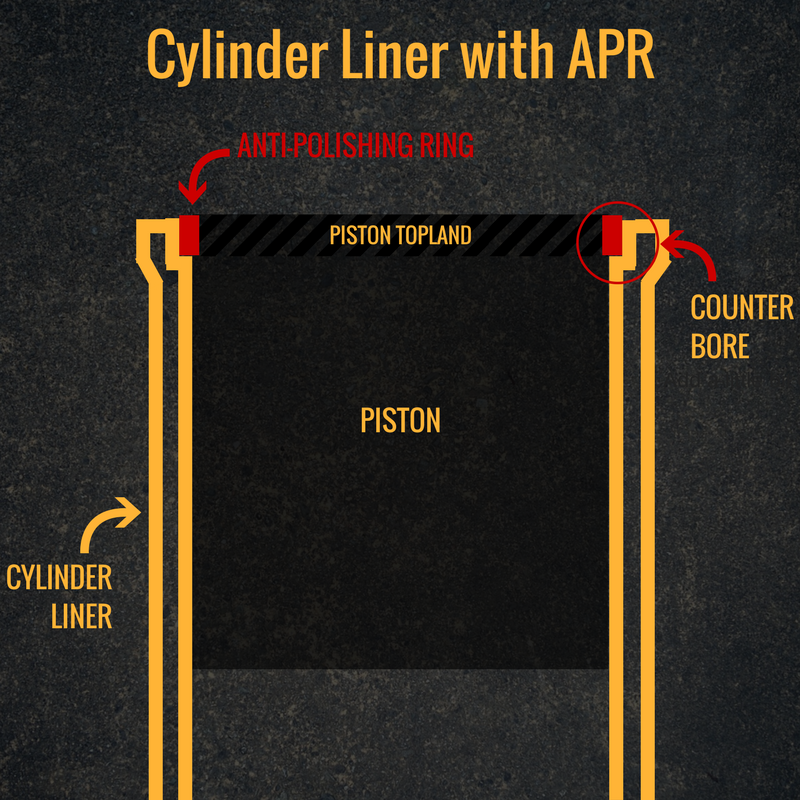 Piston installation can get a little tricky when you have an APR cylinder liner. So, let’s go in order. First, the good news is that you can usually remove the anti-polishing ring by hand. If you have a difficult time removing the ring by hand, there is a snap rings tool that will help. The rest of the disassembly process should be the same as with any other liner. The process gets tricky when you go to install the piston assembly. Because of the nature of the anti-polishing ring, you won’t be able to install the piston from the top of the liner. Therefore, you can only install the piston assembly from the bottom, unless you install the anti-polishing ring after you install the piston. You will also need a piston ring compressor adaptor tool to do the installation. Need any other technical or parts advice? Our technical parts staff have the knowledge you need to get your job done. Call us today at 844-215-3406!